Leave it to Colorado’s eclectic and inclusive government to come up with a humorous motorcycle safety campaign that features burly, biker-sounding voices singing some classic 80s songs. The goal is to remind motorists that they share the roads with motorcycle riders and that they should be aware of riders whenever driving (especially during the summertime). Despite making up only 3 percent of the vehicles on our roadways, motorcycles are involved in a substantial number of deadly traffic accidents. In fact, motorcyclists account for about 18 percent of all traffic-related fatalities in the U.S. every year. Nationally, motorcyclists are about 26 times more like to be involved in a fatal traffic crash (than occupants of passenger vehicles), per mile traveled. Motorcyclist deaths tend to peak during the summer months when more vehicles (and riders) are on the roads. Not wearing helmets is one of the leading cause of deaths when motorcycle accidents occur. At least 715 lives could be saved every year if motorcyclists wore helmets. CDOT’s campaign is aimed at promoting driving safeyy and encouraging all motorists to be more aware of motorcyclists to prevent wrecks and save lives. Be Trained Up – According to estimates, motorcyclists were at fault in about 7 out of 10 deadly crashes. Never Drink & Ride – Alcohol impairment is a huge problem in the biking community. An estimated 14 percent of those killed in motorcycle-related accidents in Colorado each year were legally drunk when their wreck occurred. Always Wear Helmet – An estimated two-thirds of those killed in Colorado within the last year were not wearing a helmet when their motorcycle wreck happened. How Much Is a Motorcycle Injury Claim Worth? First, you need to prove that the accident was not your fault. If you can prove that another party in the crash was negligent and caused the wreck, then you likely have a case. Here, however, it’s important to understand that the single best way to find out if you have a case – as well as what that claim may be worth and how to move forward to secure compensation – is contact a Littleton accident attorney at Bahr, Kreidle & Flicker. 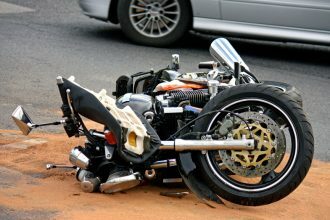 If you have been injured in a motorcycle crash – or in any type of traffic accident, it’s time to contact a trusted Littleton car accident lawyer at Bahr, Kreidle & Flicker. You can contact us today by calling (303) 794-7422 or by emailing us using the contact form on this page. Our lawyers are ready to fight for your rights to compensation and justice.